I remember sitting at our dining room table with an activity book of children’s rhymes when I was about six. 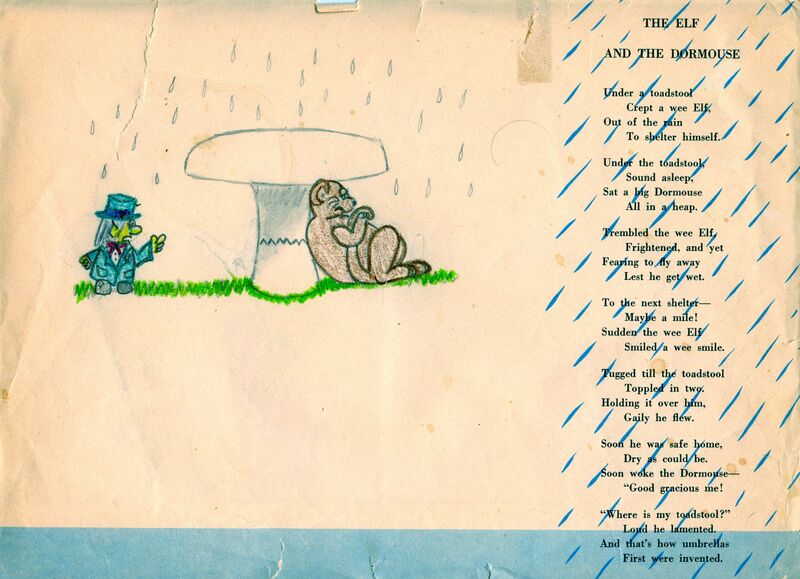 On the right side of the page was a poem about a wee elf who seeks shelter from the rain under a toadstool, only to discover that a big dormouse already occupies it. The left side of the page was left blank for the picture that would come from a child’s imagination. My coloring skills always failed to achieve what I hoped. When, on another page, I had tried to draw a woman in profile, she ended up looking like a cyclops. My brother came upon me with my crayon hovering in mid air as I willed the waxy instrument to conform to my ideal. I see what happened next in snapshots. My brother Bruce came alongside, leaning over to examine the source of my consternation, his arm draped around my shoulder. I don’t know if I asked for his help or he offered, but he sat down and started drawing. To watch him draw was to see magic in slow-motion: with pencil he outlined the toadstool, then the big dormouse slumped over in sleep, his paws folded over his chest, his legs hunched against his round tummy. To the left he outlined the elf — a leprechaun to my way of thinking — with a top hat, jacket and and bow tie. Pointed ears protruded from the elf’s long hair and his finger wagged at the dormouse. Then Bruce traced his outline with crayons — he was careful to use the sharp ones — and lightly shaded the figures. Brown for the dormouse (of course), teal blue for the elf’s jacket and hat, red for the little bow. Bruce implied the grass with a zig-zaggy line of green (I would have scribbled it all in) and left the background alone. As he proceeded step-by-step, my brother gave a tutorial. He explained that I should always start with pencil; pencil can be erased. If I followed my initial lines with color and then shaded the interior, the product would be neater. His eyes met mine often while he demonstrated.The last touch: he penciled in tear-drops of rain. I treasured the drawing as if it were an oil painting of Jesus. The masterpiece is less important than what it symbolized: that I was worth my brother’s time, his precious teenage time. At the point I am remembering, Bruce would have been sixteen. Older brothers couldn’t be expected to lower themselves to entertain little sisters. But Bruce was different. He smiled with encouragement from the pedestal I had erected for him.